Every time TW gets a package from the lobby, I meet her at the door because 9 times outta 10, it's for me. The concierge laughs at her and they've even taken to writing my name in the book, instead of the peeps. How's that for r-e-s-p-e-c-t? I could see instantly it was something good. The box was attractive and had cats on it. Open it up, Woman, I ordered. Would she do it? Nooooo. She had to take pictures of it first. It was "Keisha, stand by the box." I went over. Was she satisfied? Don't be rediculous. "Look at me, CK!" Hey, who made HER the boss of me??" I wondered, staring down and turning my back. This is the best shot she got. MOL. This smells inneresting but my address is Photoshopped out. Badly. She finally opened the box after smartly realizing there was no way I was going to cooperate. There were Greenies in the box! Five bags of them! Pastures of plenty! The Greenies Brand is introducing this new line of treats for cats that provide targeted health benefits. Smartbites treats, including Hairball Control, Digestive Care and Healthy Skin & Fur formulas, are being introduced at pet specialty stores in the U.S. and Canada. These new Greenies SmartBites feature a dual-textured crunchy outside and creamy inside and let me tell you, they're as nommy as they sound. I was actually pacing the floor as TW opened the packages and I've never done that. 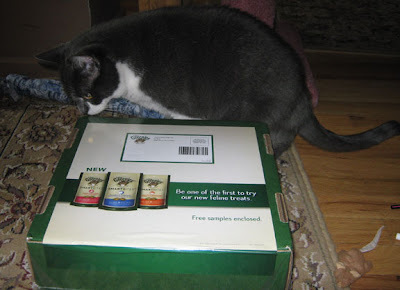 I've tried the salmon-flavored Digestive Care variety and chicken-flavored Healthy Skin and Fur variety (which also comes in salmon) and loved both of them. Strangely for me, I actually liked the chicken one better and I usually thumb my nose to chicken-flavored treats. Guess I could taste the fish oil with its omega-3 fatty acids that makes them so good for me or maybe I know I'll be even more stunning with a shinier, softer fur coat. The Hairball Control formula comes in tuna or chicken flavor and I'm salivating just thinking about it! Heh, heh, the literature says these SmartBites treats contain naturally-derived ingredients and are actually GOOD for me but they taste much too delish. Notice where I'm looking and it's NOT at her! Thank you to the wonderful folks at Trone Brand Energy and The Nutro Company for thinking of this little ghetto kitteh. I'm always glad to review a product, especially when food is involved. 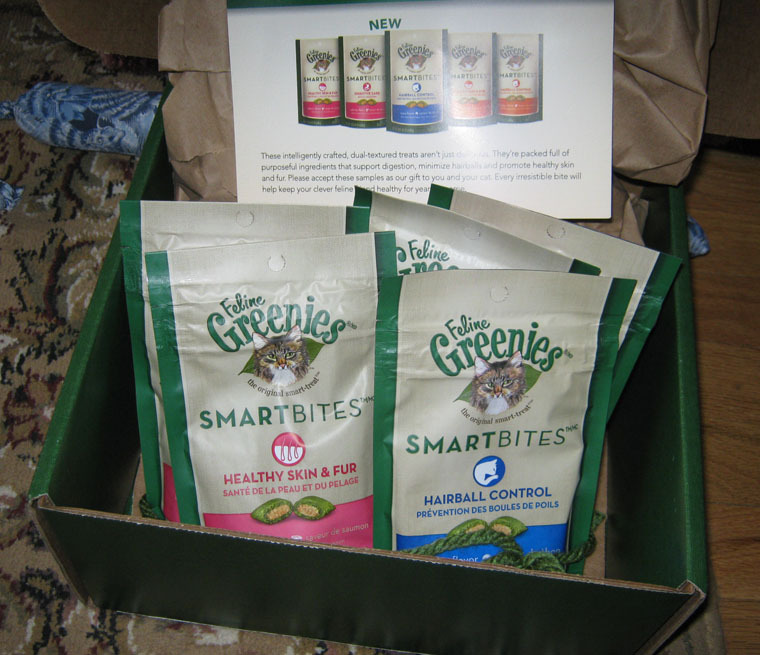 Disclaimer: While I received a free sample of Greenies Smartbite treats, I didn't receive any financial compensation to write this post. The opinions are my own. Oh CK! I'm hopping in my tunnel right after my morning after-breakfast nap and hoping you'll allow me to sample some? Enjoy Keisha. We love the thought of you having your own name signed in the mail book. Have a terrific Tuesday. Hmmm, you've convinced M that the next time she's in the pet store, she'll check them out. I has no toothies tho, so are they real chewy and large in size? If they are small in size, I can handle it. Oh those do look good. We will have to check them out. What a lucky kitty you are to get to try them all. How do we get on that list?? They all sound good. Take care. Oh it is sooooo much fun when something to eat arrives at your door! We loved our treats here! Amazingly, we still have a couple of unopened bags...mainly because my human is being SO chitzy at handing them out! So the ghetto kitteh gives these things 4 paws up? We may hasta blackmail, err...uhh...convince...Mommy to get us some. Wowzers! Those must be something special treats! Me thinks me would LOves those! Our Mail lady at the post office says me get more parcels than anybosy else in town! 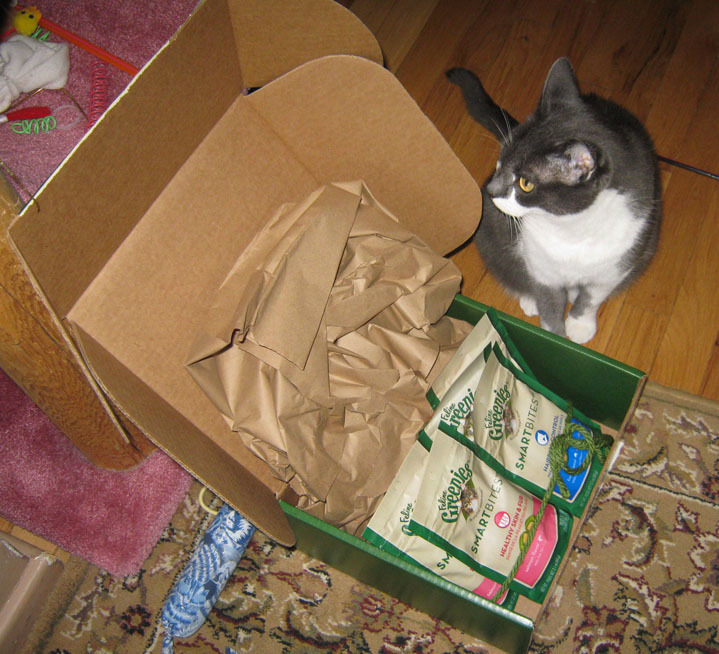 Any day a box of noms comes is a great day! Thank you so much for the condolences on the loss of my mom. The support everyone showed and the manner of her passing have been a great comfort to me. Its great knowing there are so many kind people and that I know so many of them. Thanks again! You want to know a secret, CK? My Human (Cod luff her) gets real leaky at those stories too; in fact, I think she is kinda just making up some stories instead of reading the real ones to me. She needs someone to read it first and tell her which ones are okay to read so she doesn't turn into a blubbering mess. You are so very lucky to be able to try out these new-fangled treats, CK! What is so wonderful about them is that they are actually good for you. I'm on the hunt for some of those Hairball ones for Domino. Haven't been able to find them yet, but I live in Canada and generally everything new takes longer to arrive here. Hey--got some to share??? You look mighty fine by the box! !